NB: This is only for NOKIA n-series mobile. 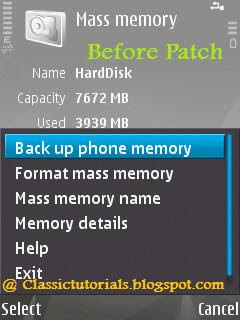 Friends i have myself tested all these on my n95 8gb and n80 IE so nothing to worry. But then also before taking risk do go through your user agreement of your mobile as it may invalidate your warranty. The procedure given below is a temporary hack and once you restart your mobile the old file format with old permissions are restored so no need to worry! This hack is actually done by ZoRn and FAC00000 . But tutorials available on net are very hard to understand for new guys,so i have modified them and kept it here. The tutorial is the same steps i followed while hacking my mobile. So if you have any question you can ask me any time. 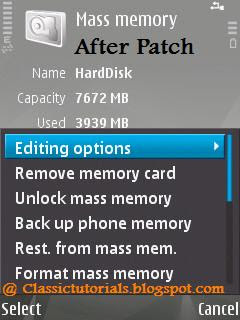 The "Patches" folder will be used afterwards so forget it for now. There are two other rar files. The ROMPatcher_FP1.rar is for FP1 mobiles and the other one is for older mobiles..
Step1: Unrar the respective .rar file. Step2: You will get a sisx(sis) file. Its the MetroTRK software. Transfer it to your phone. 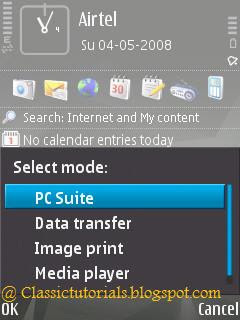 Disconnect your PC suite(Unplug your mobile from pC) Now install the software to your Phone Memory of your mobile. 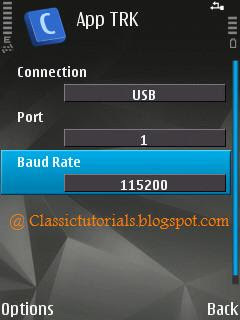 Step3: Now connect your phone to PC using the USB cable in PC Suite mode. 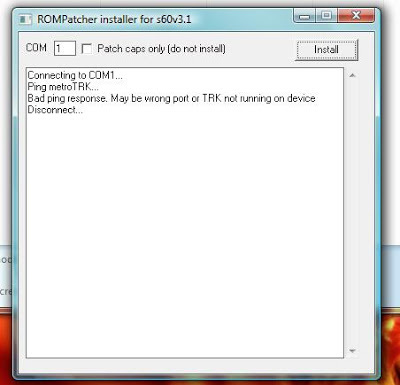 Step4: Start the TRK software. By default TRK starts in Bluetooth mode, cancel it. Then go to Options->Settings and set then as shown below. When done TRK will show connected. Step5: Now we need to find out on which port your mobile is connected. To find it out go to My Computer --> Right Click --> Properties --> Device Manager --> Ports. You should find out your port number from here. If you face problem finding out the port number just leave this step and follow the next step. Step6: On the PC now run RPInstaller.exe(You get it in the downloaded and extracted files) and enter the COM port number which we got on Step 5 . Now click on Install Button (do not tick the box). If everything is fine you get something like this. If you get error like this as given below then you are putting wrong port number. In this case recheck your port number. NB: For people who didn't got the port number don't get upset, try putting port number as 1 and try and if unsuccessful (probably you get a screen as given above)try port number 2 and so on till you get the successful message, Usually you get it connected within 20 tries :) All the best. Step7: If no errors occured, you will find a new application ROMPatcher in your phone's Applications folder (Do not start it yet). 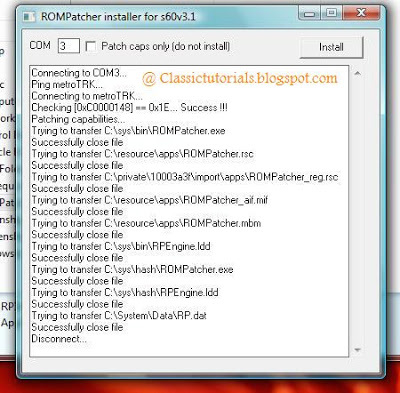 First close the RPinstaller application on your PC. Exit the TRK application on your phone and then disconnect the cable and reboot your phone. Now if you remember the file we downloaded before has a folder called Patches. 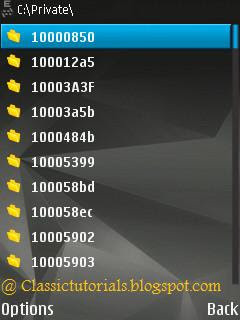 Copy that folder and paste it in the E drive of your mobile using pc suite or data transfer mode.. Now if you access using the Mobile explorer at E:Patches you will see two files.These are patches.You can open it in notepad to see what they have..
Now open your ROMPatcher again. You will see two files there. 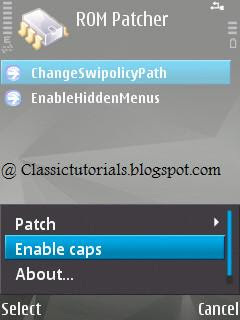 Select EnableHiddenMenus and then click on Patch and Apply. This unlocks various hidden menus. Check the screen shot below and give a try.. If you face any problem let me know, I will try my best to help you out.